This is the description of the Mathematica API bindings for the Color Bricklet. General information and technical specifications for the Color Bricklet are summarized in its hardware description. If you want to get the color periodically, it is recommended to use the ColorCallback callback and set the period with SetColorCallbackPeriod. Returns the configuration as set by SetConfig. To get a correct illuminance measurement make sure that the color values themself are not saturated. The color value (R, G or B) is saturated if it is equal to the maximum value of 65535. In that case you have to reduce the gain, see SetConfig. To get a correct color temperature measurement make sure that the color values themself are not saturated. The color value (R, G or B) is saturated if it is equal to the maximum value of 65535. In that case you have to reduce the gain, see SetConfig. Returns the period as set by SetColorCallbackPeriod. Returns the threshold as set by SetColorCallbackThreshold. Returns the period as set by SetIlluminanceCallbackPeriod. Returns the period as set by SetColorTemperatureCallbackPeriod. This callback is triggered periodically with the period that is set by SetColorCallbackPeriod. The parameter is the color of the sensor as RGBC. This callback is triggered when the threshold as set by SetColorCallbackThreshold is reached. 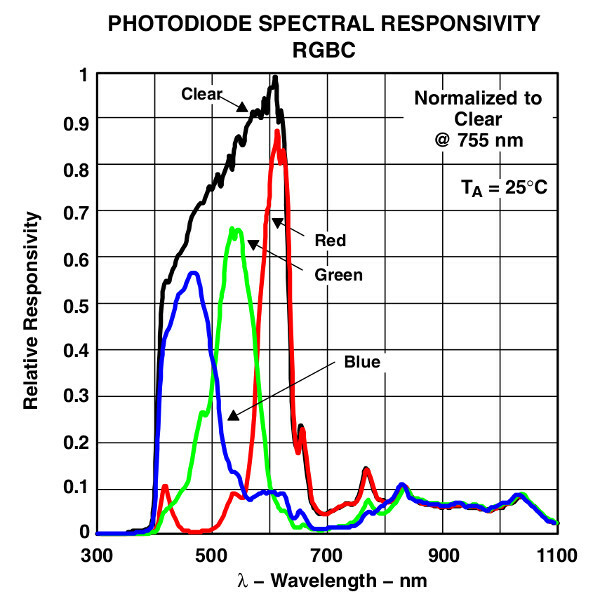 The parameter is the color of the sensor as RGBC. This callback is triggered periodically with the period that is set by SetIlluminanceCallbackPeriod. The parameter is the illuminance. See GetIlluminance for how to interpret this value. This callback is triggered periodically with the period that is set by SetColorTemperatureCallbackPeriod. The parameter is the color temperature in Kelvin.